The Roman driving for Prema set the pole position valid for race one during the last few seconds of the session, Maisano kept at his back Agostini and Marasca. In the second session two red flags and the best time set by JD Motorsport's driver from Padova ahead of Giovesi and Cheever. 31/08/2012 - Eddie Cheever and Riccardo Agostini, same names challenging each other. The Roman secured the pole position of race one, while Agostini that of qualifying 2. In qualifying 1, valid for the grid of the first race, Riccardo Agostini with the Mygale of JD Motorsport was at the lead until when 20'' were to go, but then the sting in the tail with Eddie Cheever setting a very good 1'41''509 and Brandon Maisano, Cheever's team mate on the Dallara F308 of Prema Powerteam. Between the French and the Italian only 8 thousands of a second. Very good performance for Mario Marasca that completed the second row on the side of Agostini as he set with a best time of 1'41''792. 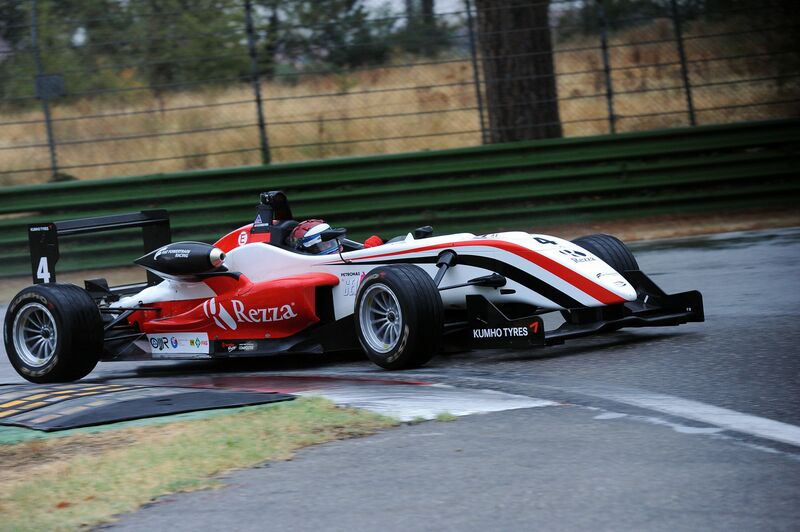 The third row went to the third Prema Powerteam's driver, Henrique Martins that will have Euronova's Sergey Sirotkin at his side. Seventh place for the Canadian of JD Motorsport, Nicholas Latifi just 9 tenths from the poleman Cheever. The top seven drivers of qualifying one were all within a second. The eighth place went to Roman De Beer (Victoria World) who did not manage to reproduce the same result he showed on the wet. Behind him the Japanese of Euronova, Yoshitaka Kuroda. The two drivers of team Ghinzani had a troubled session as the rookie Dalewski managed to complete only 3 laps before ending sanded, while Kevin Giovesi had to stop right after the green flag due to a problem to the axle shaft. The second qualifying was marked by two red flags deployed with 6 and 3 minutes to the end. Marasca first and Martins afterwards made stewards stop the session. Dalewski managed to get back on track, Martins was forced to leave it instead. The pole position went to Riccardo Agostini with a stunning 1'40''542, that relegated the Milanese of team Ghinzani, Kevin Giovesi, to 460 thousands but counter-charging after qualifying 1. The third time went to Eddie Cheever, who will share the second row with his team mate Brandon Maisano. Between the two team mates only 15 thousands of a second. The third row was obtained by Mario Marasca, that is the only driver racing with team BVM in this weekend and Henrique Martins, who set a 1'41''662 before exiting the track. Seventh time for the Canadian Nicholas Latifi (JD Motorsport) who proceeded the other Mygale driven by Roman De Beer. The last three positions of the grid were occupied by the Euronova pairing with Yoshitaka Kuroda leading Sirotkin while Jakub Dalewski (Ghinzani) ended the bunch. Race 1 will start tomorrow at 14.55 (GMT+2) with live coverage on Rai Sport 2 and web streaming available at www.acisportitalia.it/F3.